The next piece of our Born this way series is by Evelin. Read the others' stories as well and find the series summary HERE. This picture was taken in 1999. In the picture I’m doing a performance in my favourite outfit, on top of the couch. 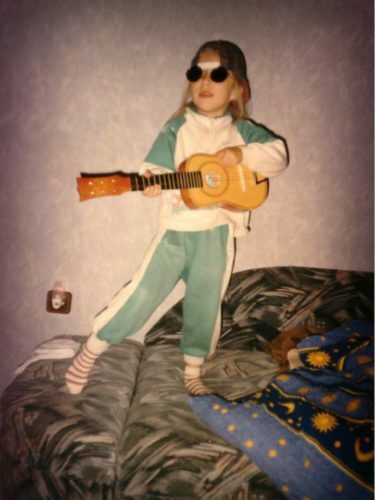 Even when I was small, I used to love to dress up a little more boyish, I often wore baseball caps and hid my hair underneath them, to trick people into thinking I was a boy. Back then I didn’t know what it meant to be gay, and I didn’t know that a girl being with another girl existed. That’s why it made things harder when in kindergarten I found out that I had two different kinds of loves. Norbi, whom I mentioned when somebody asked me if I fancied anyone, and Barbi, whom I kept as a secret. She was my first secret crush, and I didn’t tell anyone about her. Later on, in elementary and high school I also had girl crushes in secret, and I fell a little bit in love with them unknowingly. The turning point came when I attended university. The accepting surroundings helped in admitting to myself that I was gay. It took one or two years and a martini-soaked night to come out to one of my best friends for the first time. She took it very well, she was understanding and interested in the news. I felt that my coming out brought us closer. I knew there was no stopping now: I had to open up to my other friends, too. I feel lucky because everyone took the news similarly. The next big step was to admit it to my family. It was the hardest to break the news to my mother. I was afraid that she would be disappointed, but I knew it was something I had to do. One night I told her while I started shaking and crying: “Mom, I’ll never marry a man, because I’m gay.” She asked me since when I had known. I told her that I’ve kind of felt it since I was in kindergarten, to which she started crying and said: “You’ve been carrying this secret all this time? Is this why you never seemed happy? I’m glad you finally told me.” I knew this wasn’t the end, because coming out is something you have to do constantly. Any time I meet new people, I have to admit who I am eventually. Luckily, the good thing about coming out is that it gets easier each time. These days, I’m able to casually bring it up in conversations: “by the way, my partner, who I’m living with is a woman”. Not long ago, my coworker only realised I was gay when I was telling them about my partner’s menstrual cramps. My mother also helps a lot in spreading the word around. She can hardly wait for someone to ask her about me, and she mentions that I’m gay within the first three sentences, waiting for a reaction, which is usually positive or neutral. Of course, there are negative experiences too. One time she was telling about me to her old classmate, whose answer was that she felt sorry for my mom to have a daughter like that. My mom’s response was: “I’m sorry for your child to have a mother like you”. For me, coming out is a positive process. It’s a lot easier not having to fake every conversation, just being honest about my feelings, not having to be afraid of accidentally outing myself. I used to feel like I was building walls around myself, but by now these walls have crumbled. I’m living happily with my girlfriend, we travel together with our friends, we celebrate Christmases together. When we were watching a movie last week, I was thinking about how proud my childhood-self would be of me. I feel like I’m finally happy.